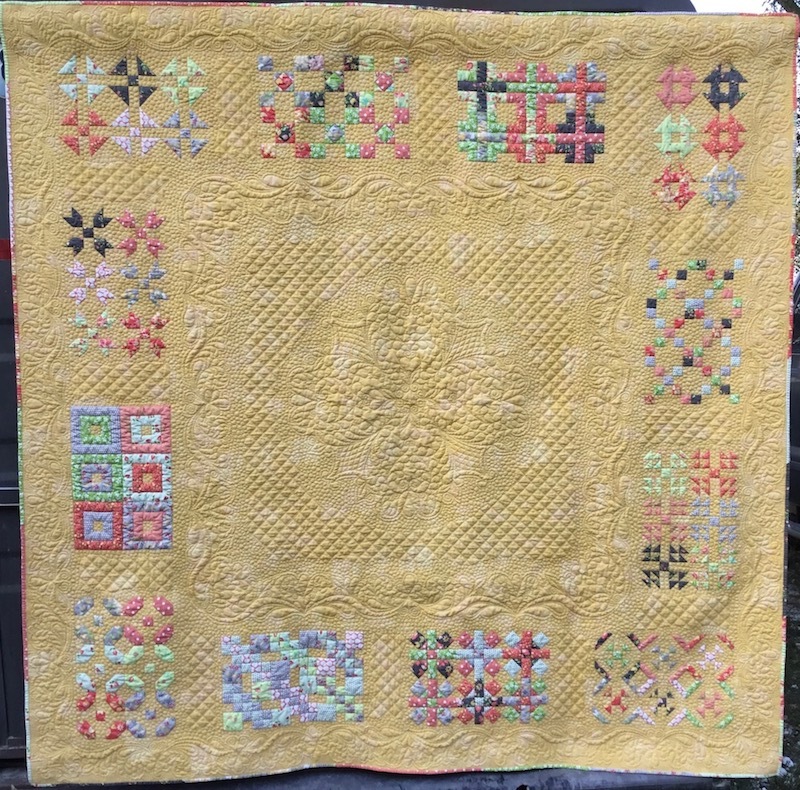 The new Block-of-the-Month quilts are ready at Sew Sweet Quilt Shop, and signups are happening NOW for their 2017-2018 “It Takes Five!” Saturday Sampler Club! You buy the pattern, Sew Sweet Samplers, from Sew Sweet Quilt Shop (made exclusively for them, by me). Then purchase a block kit each month for 12 months. Each block kit is only $5 if purchased in the store. Block pick up in the store will be on the 2nd Saturday each month. If you can’t make it into the store on Second Saturday, you can have them ship your block to you for an additional $2.75 for shipping (or pick it up later, if you know you’ll be in). The blocks are packaged in the same or similar fabrics shown in the quilts. 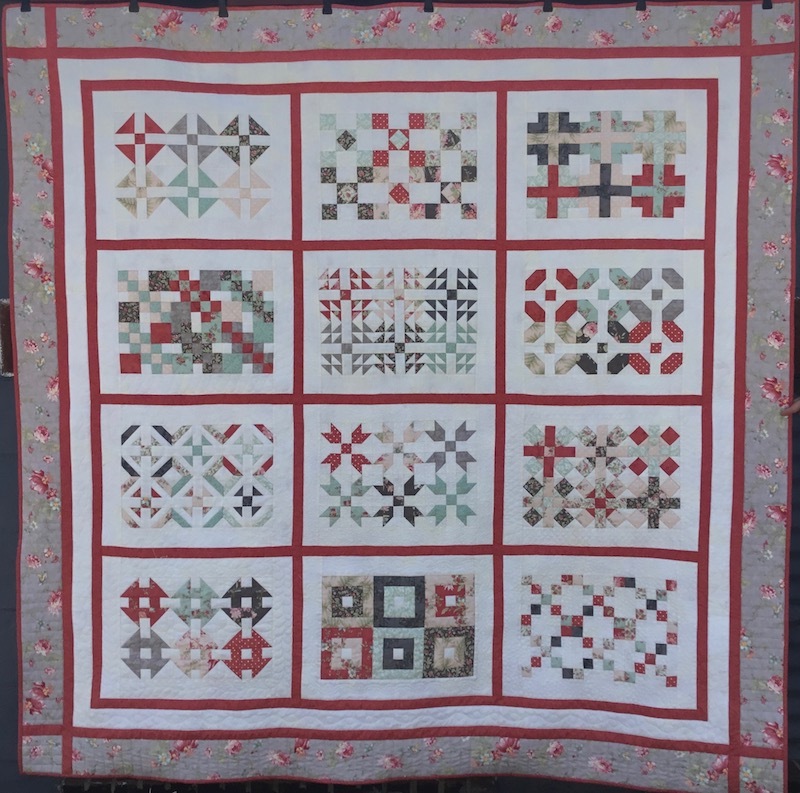 The pattern has complete block instructions for the 12 blocks and the two setting versions, traditional or modern, which are interchangeable. Throughout the year that this BOM is running (September 2017 through August 2018), we will be presenting lots of different setting options for your blocks and a variety of free bonus project patterns. However, you will only get these free bonuses if you are signed up for the program! Pay for BOM upfront $93 (includes shipping) and Sew Sweet will ship your block kit the week following the 2nd Saturday of each month. Sew Sweet will keep your shipping address on file at the shop. Allow Sew Sweet to keep your credit card on file and charge you $7.75 each month; they will ship your block kit the week following the 2nd Saturday of each month. Your shipping address and credit card info will be kept on file at Sew Sweet Quilt Shop. Pick up at Sew Sweet Quilt Shop on 2nd Saturday of every month for $5 each. Remember, there are two color options to choose from, the bright Modern and the Traditional — or choose BOTH! The monthly block kits contain only the fabric needed to make the individual blocks. Any fabric you need for your chosen setting will need to be purchased separately. The bonus information and bonus project patterns are free if you are signed up for the BOM, and will be presented periodically throughout the duration of the BOM at the Second Saturday “It Takes Five!” Club meetings. To sign up, call Sew Sweet Quilt Shop at 660.548.3056 or email jessica@sewsweetquiltstore.com. Can’t wait! I’m all signed up and ready to go.